It's not often that I go shopping, and when I do I don't spend much at all. (Did you know the average American family spends $1,700 per year on clothes, according to the Bureau of Labor Statistics?) I'm not above receiving things secondhand, and it's rare that I purchase items brand-new. If I do, I make sure the piece I'm purchasing is timeless, durable, and I try to purchase it on sale. Don't get me wrong--I'm definitely not the perfect shopper. One example is there are things I could do to be more environmentally conscious when shopping. I typically don't buy used jeans because I can never seem to find a style and size that fits correctly. I haven't purchased a new pair of jeans since 2012, so my purchases are few and far between, but that's something I could work on. Today I was feeling very ambitious. I stopped by the consignment shop to drop off a book and pair of snow boots. (I usually just donate to Goodwill unless I'm confident the item will sell.) My goal was to find something my daughter would like for Christmas. My favorite thing is finding an unused item being sold secondhand! 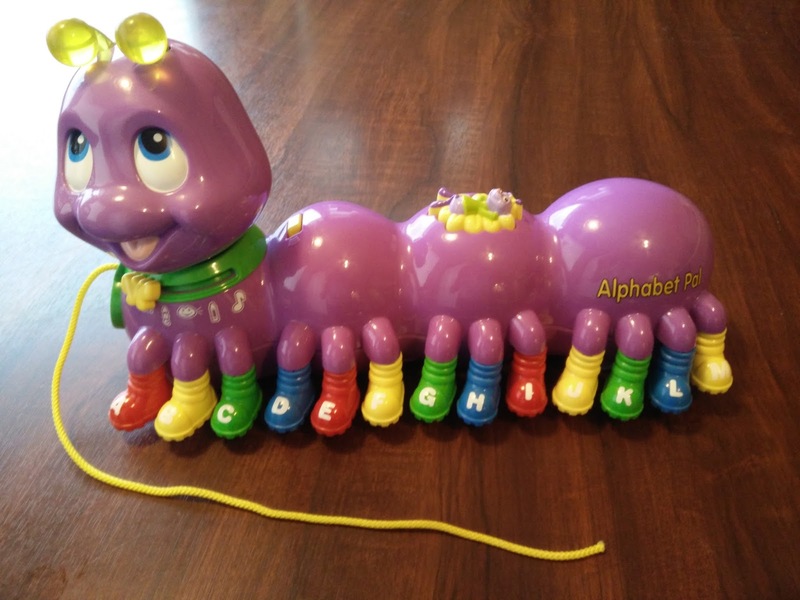 At the consignment shop, I picked out a Green Bay Packer cheerleading outfit for my unborn daughter, and for Audrey I picked out a caterpillar toy made by LeapFrog that teaches kids the alphabet. 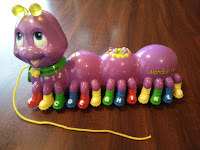 When I teach at the YMCA, Audrey loves playing with that caterpillar. Once I got to the checkout, the clerk told me that I had a $10 credit, so that was a great surprise. The $10 credit came from a violet Bumbo Floor Seat that was given to me. Audrey didn't like it very much, and I didn't anticipate using it for the next baby. When I went to sell it at the consignment shop, they told me that it had been recalled. I looked online and found that the company ships a seat belt for free to customers. The belt needed to be installed to fix the product. Once I did that, the consignment shop was able to take it, and the resell value was high. It was exciting! 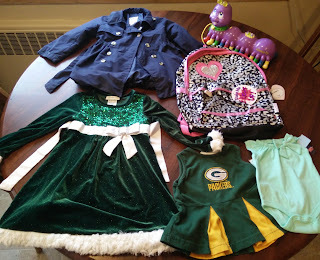 I went to Goodwill after that in search of new or gently used kids' stuff. I found a brand new backpack that Audrey needs (and will love) as well as a newborn onesie. I went to the checkout counter and learned it was student discount day, so I showed my Seminary ID and Goodwill Club Card, and the total came out to be $6.00. My only downfall on this trip is that I forgot about a 20% coupon I had at home. That would have been better than my student discount. This past August, West Bend held a city-wide garage sale day. I was on a tight schedule, but I found a beautiful green Christmas dress and blue GAP jacket in a size Audrey didn't have. The jacket and dress were timeless and in great shape. I paid $3.00 for the lot. It's strange to think about shopping being a hobby for someone who's trying to become minimalist. It's contradictory, and I understand that. I'll admit that I don't think I needed the items that I purchased, but I'm pleased with the way I shop and value material objects. 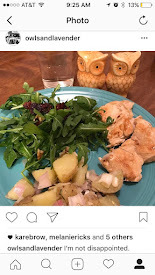 Our home is cozy, so we don't have a lot of room for excess; however, I find joy in finding bargains for fun items, re-purposing things that are old, and swapping out used household items for other used household items. It might not be a minimalist mindset, but it's fun, nevertheless.